It’s finally chilly enough to wear my favourite sweater from boutique cashmere company Banjo and Matilda. You’ve only seen it on the blog once before, but rest assured I’ve been wearing the crap out of it since then (you’d want to; it cost the earth) and it’s held up really well. It always gets comments when I wear it. But it’s definitely a statement piece; people tend to notice if you’ve worn it three days in a row. 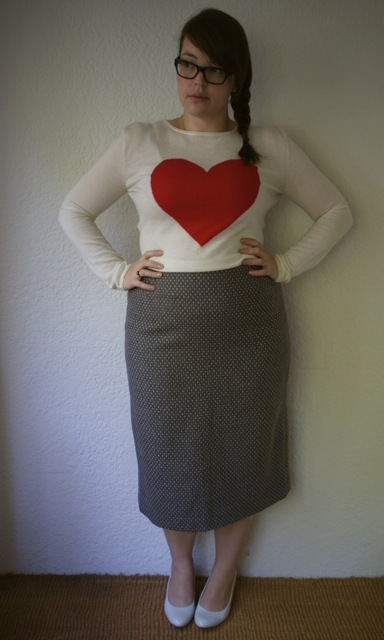 I often dress it down with jeans, but after seeing an outfit from Essential Antwerp pinned on pinterest I was inspired to try it with the vintage wool pencil skirt I bought from the A+ Market during the Curvy Couture Roadshow. The A+ Market is a regular event that takes place around Melbourne (and this weekend, Ballarat!) showcasing independent plus-size fashion, jewellery, bags and accessories. Like the straight size Take2 Markets, A+ also allows general punters the opportunity to set up their own stall to sell to sell their pre-loved goodies. SO much easier than eBay! This skirt was from the range of vintage goodies that were on offer on the day, and it fit like it had been made for me. It’s fully lined, and made of a woven wool (?) fabric in dove grey with teeny little dots in a blush pink. 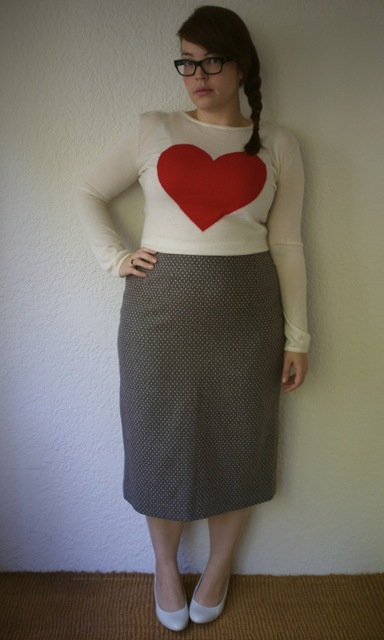 The midi length means that to keep it from looking dowdy it almost HAS to be teamed with something fun and contemporary, so my heart sweater fits the bill nicely. 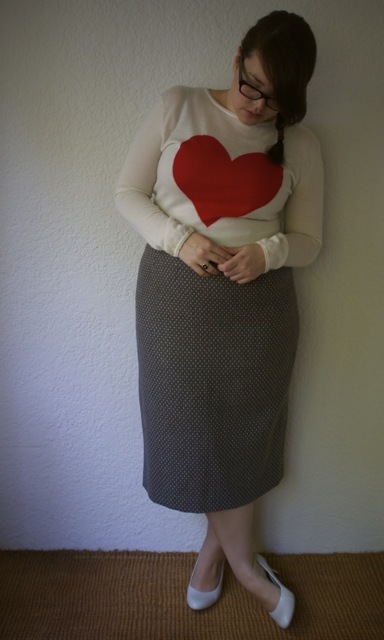 This entry was posted in Uncategorized and tagged banjo and matilda, cold, shoebuy, skirt, vintage by lillipilli. Bookmark the permalink. Hugs to you, lovely lady! Looks gorgeous- I find that midi length so hard to wear but this is perfect/ classy yet funky! I dream of one day owning a banjo and Matilda jumper! Had I not been so worried about loosing my seat I would have found it first damnit! That sweater is $365 USD. How do you do it, girl?